Oddly despite all the wedding crazy we had the best month we have ever had from budget perspective. The way I handled this month was to remove all direct wedding expenses and last minute costs for the wedding itself, and leave in meals, clothing and travel costs because if you attended a wedding or family event you might have similar expenses. Based on this criteria we only spent $3804 this month. 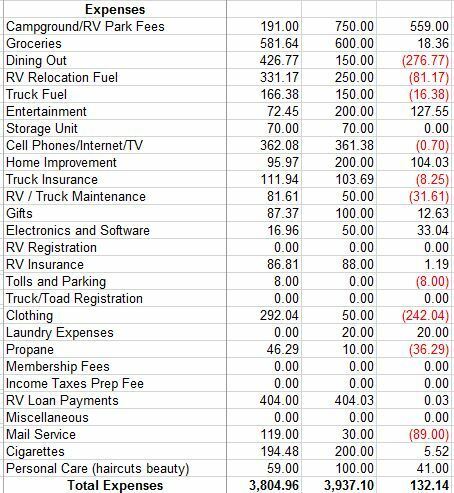 We only spent $191 this month on campground fees. To be clear, our actual cash flow was much less, but that money came out of contingency funds. The incidentals weren’t that bad. We spent less than $750 in last minute incidentals which is a testament to the good job Kat did on planning the wedding. For more detail on each category please see below. This amount was updated in August when I discovered I left out our RV payment. I apologize by the mistake which was caused by rushing to get the post out before a work trip. Campground Fees – The first two weeks we “moochdocked” on the Miles family farm, which was wonderful. We could have stayed there the entire time, but wanted to be closer to the wedding venue during the week of the wedding. The last week of July our campground costs were covered as part of the compensation package for the video production Lee is doing for Howard. Both moochdocking and work kamping are totally legitimate ways to keep costs down in this area and we are very excited to finally be able to save some money in this category. Groceries – We’re happy this category stayed under despite stocking up at a Walmart before going to northern Minnesota. It will be interesting to see how we do in August with a stocked cupboard but more expensive local groceries. Dining Out – We went over by $276. The bulk of that was the Ecuadoran lunch we bought for all the kids which came in at $170. I left it in because sometimes you just want to pick up the check. Bill and Kelly can relate! If you take that meal out and offset with the $127 we were under, in entertainment it wasn’t that bad of a story. Plus, we ate quite a bit of fast food this month. We were running all over the place and providing meals for the people that volunteered with the wedding setup. Individually, small dollar amounts, but it does add up. RV Relocation – For the first time in a while we went over in this category, but we are $2K under for the year. It will be interesting to see how this is affected when we head out west next month. Cigarettes – We have been rolling our own cigarettes for one year now (using finely shredded pipe tobacco, an electric roller, and tubes you buy for around $3 a box) and our average monthly costs have gone down from $520 a month (two cartons a week ) to $125 a month. This is a substantial savings and of course it would be nothing if we quit but since that’s not in the cards for us right this moment, saving all that money makes this possible. As an alternative, our friends Jo and Craig have changed 100% to vapor which has the advantage of being better on the budget and a healthier alternative. Either way if you smoke and want to be a full-time RVer we definitely recommend you look into it. There is way to much variation in cigarette prices from state to state and rolling our own allows us to pre-buy tobacco when it’s cheaper. Clothing – Over by $242. This was some of Lee’s suit, earrings for me to wear to the wedding, and an extra set of sunglasses when I misplaced mine. Thankfully I found the originals. I love those glasses and bought them in an airport so could not necessarily find them again. I left the bulk of this in because when you are going to a special event you might need a new shirt, shoes, or dress. It happens. Personal Care – I was shocked we were under in this category. Lee got a haircut and I had my eyebrows waxed and a trim but nothing else. I did help pay for some pedicures for the girls prior to the wedding but left that in as a wedding expense because I wouldn’t have done it normally. I do miss my pedicures quite a bit! At $32 a pop though I just can’t justify it. I keep trying to talk Lee into giving it a try but he is not interested, plus the best part is the cool massage chair and hot towels and I don’t think he could duplicate that. So, it was a really great month and since two weeks of August campground fees are also covered, we’re looking forward to seeing how next month goes. We may actually be getting the hang of this. Hope I didn’t jinx us !! This entry was posted in Uncategorized and tagged Full timing budget, RV Full Timing Budget. Bookmark the permalink. Another month with $500.+ savings and lee could have his drone!!!! Lol or we could put money in contingency !!! !